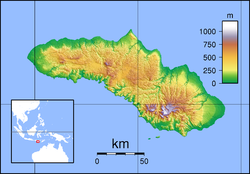 Southwest Sumba Regency (Indonesian: Kabupaten Sumba Barat Daya) is a regency on Sumba in East Nusa Tenggara province of Indonesia. Established in 2007, the regency has its seat (capital) in Tambolaka. Its population was 283,818 in the 2010 decennial census, the most of any regency of the island. Wikimedia Commons has media related to Southwest Sumba Regency. This page was last edited on 29 July 2018, at 23:43 (UTC).